The drunken genius is a romantic trope well-loved in America. Tom Waits admitted that in his early days as a singer he thought there was no higher pinnacle than being a boozy barfly somewhere on the edge of town. F. Scott Fitzgerald, Ulysses S. Grant, both men embody nobility but will never be remembered without their fondness for the bottle. A beautiful doom awaits the alcoholic in our art, men whose souls transcend their world and whose flesh is all too human. Flight takes that beauty and inverts it, as surely as its protagonist inverts his doomed plane, pulling back the romance to give an honest glimpse at what kind of life the “romantic alcoholic” really lives. 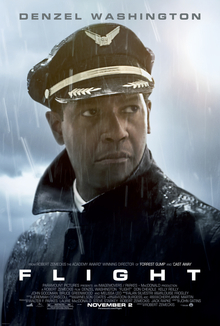 Denzel Washington plays Captain “Whip” Whitaker, a great pilot who manages to pull a miracle in mid-air when his plane fails and sends it plummeting to the Georgia fields. Six people die in the crash but the remaining ninety-six souls survive, making the man a hero. But during the investigation of the flight questions arise concerning Whip’s sobriety. There is no doubt amongst his colleagues that Captain Whitaker was the only man who could have saved the plane, but did he have the right to be behind the wheel? From director Robert Zemeckis, Flight is a two-hour character study of Captain Whitaker. Two absolutes are established in the very beginning: That the plane fails due to a mechanical failure and that Whip is a substance abuser. The film then follows Whip through the aftermath of his triumph, steadily letting his personal demons consume him. His unspoken guilt over what he knows to be true hollows out his miracle, turning him against the very people trying to help him, friends, lovers, lawyers, co-workers. That’s what alcoholics do. Zemeckis has turned in a surprisingly uncompromising portrait of addiction, a solid R picture from a major studio that deals with a character whose talents have guarded him from scrutiny for so long he believes himself untouchable. Yet this film would be half of what it is without the power of Denzel Washington in the lead role. Washington is an intensely American talent who goes all in with this performance, acting from his eyes and from his posture, through his fingertips and the nervous grinding of his teeth and the popping of his tongue. He is riveting. It is due to Washington that the heavy-handed moments in the film do not disrupt its flow unduly. Though Flight is a good story, not all of its elements mesh so well. Whip’s God-fearing co-pilot seems lifted straight from a Troma film and from a tonal perspective, towards the film’s end it seems to be less a story about Whip we’re focusing on but instead an aesop about the damaging effects of alcohol. Washington is such a good actor that the more blatant the script gets the more obvious it is that he is transcending his material. The stand-out co-stars are Kelly Reilly, who plays Whip’s love interest and recovering heroin addict, and John Goodman, who plays Whip’s drug dealer/confidant and proves that the devil you know is also the funniest guy in the room. This is a great return to form from Robert Zemeckis and refreshing proof that real, mature films can still be made in this decade. Flight was produced for $31 million and succeeds on genuine performances that revolve around real issues of relationships, personal identity, and self-destruction. Whip is not ignorant of his failings, and though he possesses the skills of a hero, one miraculous deed does not erase his past sins. His alcoholic is not romantic, not someone to be emulated. He is honestly corrupt and honestly portrayed as such. Such contradictions reinforce his humanity and make him fascinating to watch. The flight may have been saved but the rest of the film is one long, inevitable crash. It’s impossible to look away. held up the movie with his style and intensity!! Thanks, Janet! And yeah, Washington’s one of those few actors that you can just flip on the camera and follow. He’s incredible. As I discovered during my Leprechaun marathon research, this movie was written by the Academy Award nominated star of Leprechaun 3. Not Warwick Davis, the other guy. The guy that Warwick Davis bites and turns into another Leprechaun. He wrote this movie. Man, Hollywood’s a wacky place. I think we can safely say that dude paid his dues though. Good review Pierce. I have to say, even though the story does get a bit soapy and melodramatic by the end, Denzel keeps everything else above the ground and gives one of his best performances in a long while. No wonder why he got nominated! I was disappointed and actually surprised at the melodrama towards the end. Some of the movie is really mature and some of it gets almost parodic of itself. Very nice review of this magnificent movie. One of my all time favorites.